BioPharmaceutical grade, a 2-channel (0.5 µm and 5.0 µm standard) particle counter with built-in vacuum pump. Users have the option of either 4-20 mA output, Ethernet Modbus, and other configurations. Comes standard with 1 CFM flow rate. Other particle sizes, flow	rates, and custom configurations may be available. 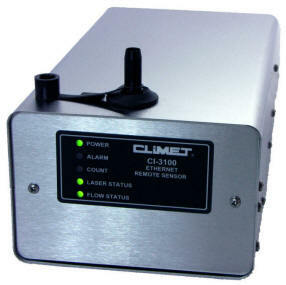 In business for over 55 years, Climet has dozens of multi-jurisdictional patents in the field of particle counting. The CI-3100 RS Series is fully compliant with ISO 21501-4; PIC/S; FDA CGMP; EU GMP, Annex 1; ISO 14644-1/2:2015; 21 CFR Part 11, and others. The CI-3100 OPT Series is a 2-channel particle counter used in continuous monitoring applications in a variety of industries - generally Grade A or B (ISO 5) clean zones. On/Off functionality is remotely controlled via software, and additionally, the CI-3100 OPT is VHP compatible ensuring easy cleaning and sanitation. An expert in manufacturing industrial instrumentation, every new instrument design is drop and vibration tested ensuring end-users can expect up to a decade (and beyond) of reliable operation. This level of ruggedized testing is unique among other manufacturers, and ensures accidents don't turn into capital appropriation requests or expensive repair bills. Customers in regulated industries are generally required to re-calibrate their particle counter annually. Depending on the process or risk assessment, the CI-3100 is typically calibrated at six month intervals, or even more frequently. When a particle counter is out-of-tolerance (OOT) during the interval calibration, a deviation report and investigation is required in regulated industries. Among pharmaceutical and biotechnology producers a simple failure investigation (assuming no batch rejection) costs between $8,000 to $12,000 on average. This cost is difficult to calculate as it's almost all labor and usually involves multiple departments. It is a hidden Cost of Poor Quality (CoPQ) associated with the instrument, which few end users track. As the cost of one simple failure investigation well exceeds the initial purchase price of a particle counter, we can conclude that CoPQ is the #1 cost driver.